In 1989 the BBC presented a short series of 30-minute programs about: The Victorian Kitchen. The show was filmed in a refurbished kitchen of the period, furnished with period utensils, and the roles of cook and gardener were delightfully performed by a lady and gentleman who recreated for film the positions they had actually held in real life in English great houses and country estates of the past. The show is entertaining on many levels. (Clarinettist Emma Johnson plays the opening theme music.) Anyone who likes cooking from old cookbooks may find it illuminating to watch Head Cook Ruth Mott make dishes using 19th century recipes and kitchenware, as she reminisces about kitchen ways, now fallen out of use and forgotten. The Victorian kitchen for which Eliza Acton and Isabella Beeton wrote their cookery books comes to life through Mrs. Mott’s cooking and remembering, and one may more easily imagine how to recreate some of those dishes today. 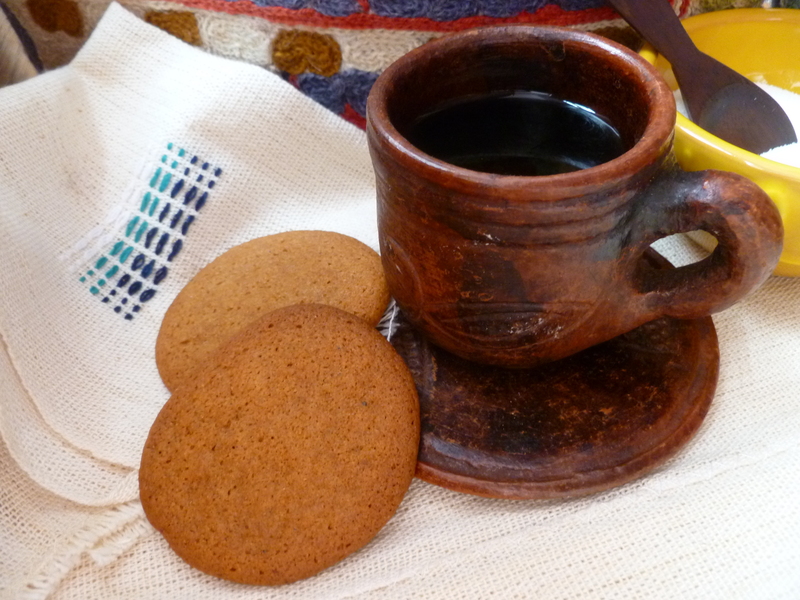 Here is a recipe for one of the tea table classics: The Gingersnap. 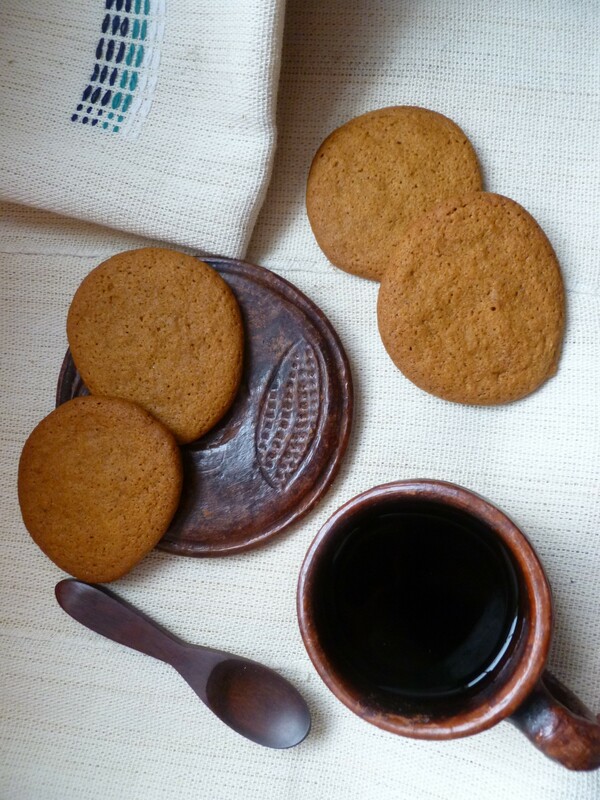 in addition, the peppery spiciness of the little biscuit makes it a quintessential cold weather cookie. A Timing Note: After the dough is mixed and formed into logs, it must be chilled in the freezer. About 30 minutes, or a little more, is a good estimate of the time it will take for the dough to harden enough to cut into rounds for baking. 2 cups (280g) of White Unbleached Flour: If you aren’t weighing the flour, measure it by pouring it into the measuring cup and leveling it off. 1 or more Baking Sheets, lined with Parchment: The dk used a single baking sheet for the photographed cookies and only 1 sheet of Parchment, allowing the sheet and parchment paper to cool a little between batches while cutting the dough for the next round of baking. The baking sheet used measures (across the top) 15.5 in. x 10.5 in. (40 cm x 27 cm). 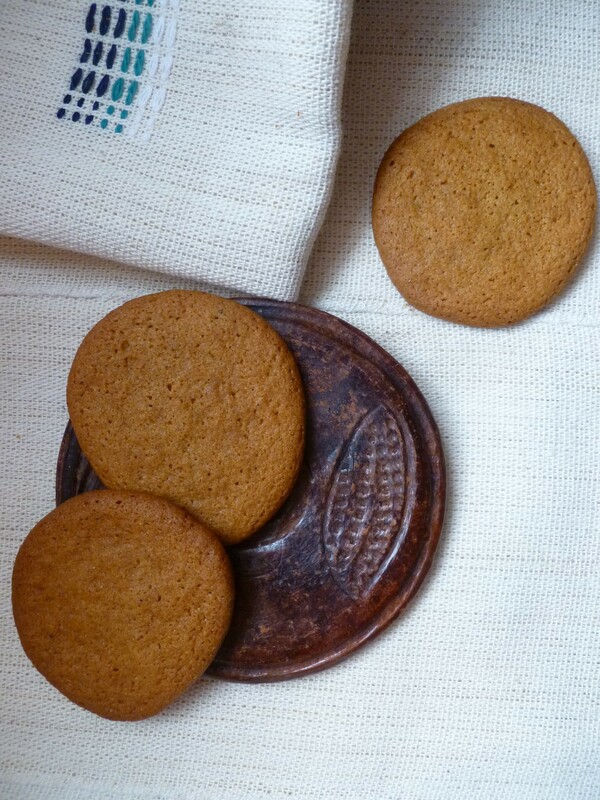 A sheet of this size will bake a dozen Gingersnaps at a time. 1. In a mixing bowl, stir together the flour, baking soda, ground ginger, ground cinnamon, and ground black pepper. 2. In a second bowl, beat the butter until it begins to lighten and add the sugar. Beat the mixture until it is smooth. 3. 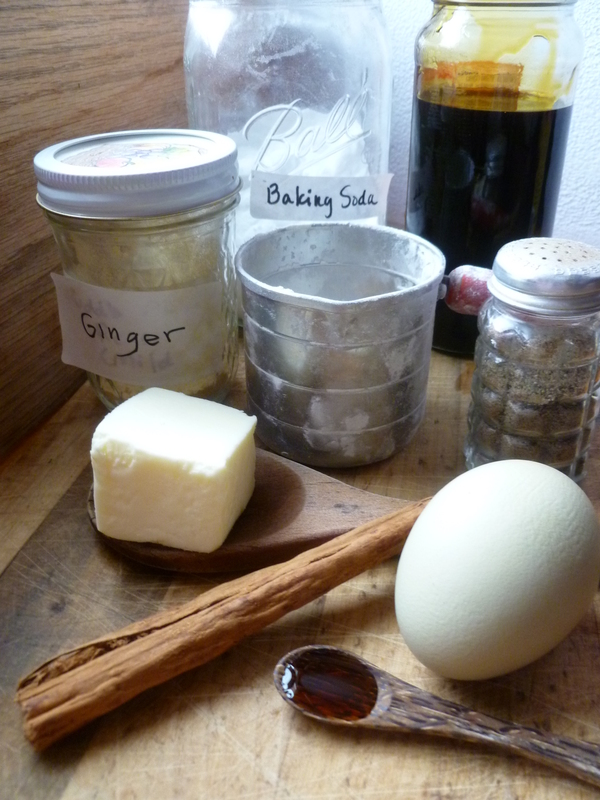 Stir the molasses, the vanilla and the egg into the beaten butter and sugar. 4. Add the dry ingredients to the molasses, vanilla, egg, butter and sugar mixture and stir until a smooth dough forms. 5. Divide the dough in half. Place half on the lightly floured pastry board, flour your hands a little and, with a light hand, roll the dough into a log of about a 2-inch (about 5 cm). Do the same with the second half of the dough. 6. Wrap the logs in plastic wrap or waxed paper and freeze them until they are firm enough to cut into rounds with a knife–hardening may take about 30 minutes or a little more. 7. Preheat the oven to 350 F (180 C) while the cookie dough hardens. 8. When the dough is hard enough to cut, take out a log, place it on the pastry board and slice off 12 rounds–or more if your baking sheet is a large one or you are baking multiple sheets at one time– (each about 1/4-inch thick). Place them, leaving roughly 2 inches of space between them, on a parchment lined baking sheet. Return the uncut portion of the dough log to the freezer. 10. 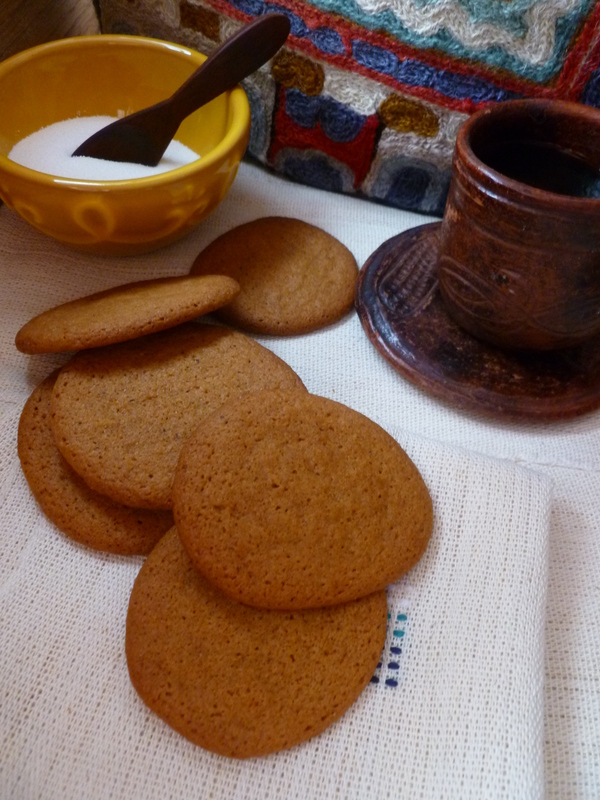 Gingersnaps keep for many days in a cookie jar or tin. Their flavour continues to develop and becomes a little more pronounced over time. A Note and an Acknowledgement: Gingersnaps Chez Panisse are part of the Dessert Course in the Lunch Menu: A Cold Winter’s Day Luncheon Menu Reminiscent of Sunny Climes. The recipe is adapted from one in a cookbook by Alice Waters (founder of the restaurant Chez Panisse in Berkeley, California), The Art of Simple Food (2007). And the flavour of it improves as it ‘reposes’ in the cookie jar.